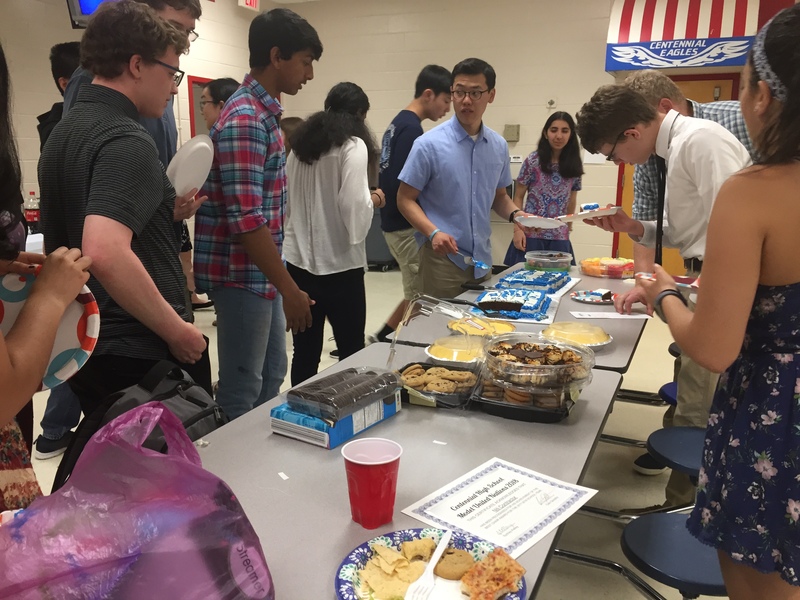 Centennial’s Model United Nations Club hosted its annual end-of-year potluck banquet on Friday, May 4, in the school cafeteria. Dozens attended to look back on and celebrate a successful year of conferences. The event kicked off with a slideshow of the year’s events, showcasing the delegates at their best and weirdest. Superlatives followed, each winner awarded a certificate. In typical Model UN fashion, categories included “Most Dilatory” and “Most Likely to Be Stalin” — most of the winners did not come as a surprise. Once the laughter died down, the Co-Secretaries General, sophomores Caio Goolsby and Sydney Kelley, presented speeches about all the seniors in the club. Several people became teary-eyed. Seniors from the 2017-18 board concluded the activities of the night, taking the podium to deliver their last messages of their high school Model UN careers. 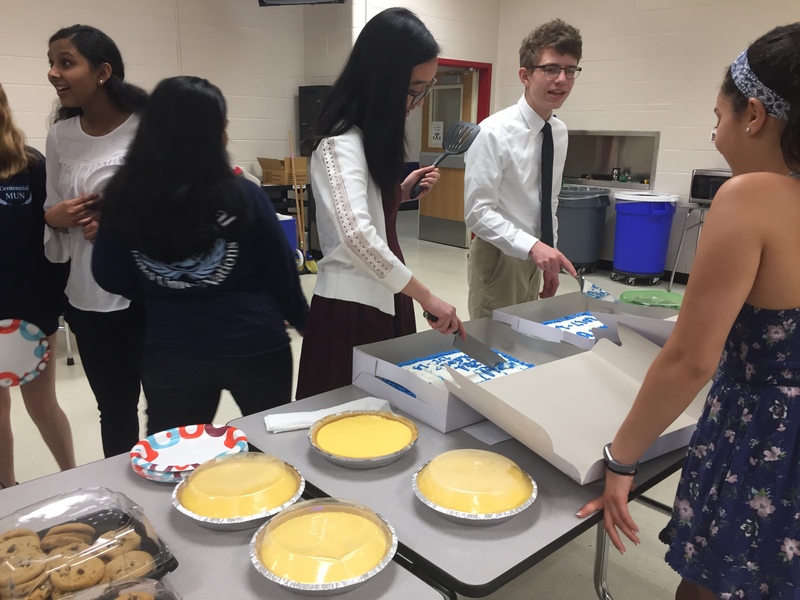 Bryce Plunkett spoke about the skills he developed through the club, and added, “Make sure if you have siblings, tell them to join and keep the cyclical nature of Model UN going.” He was one of many club members who had joined because of an older sibling. “It’s been a rigorously riveting, intellectually stimulating four years,” Alex Na summarized. A self-described “deadweight” in freshman year, he invested more time and energy into the club throughout high school, eventually earning the position of fundraiser. Ms. Galante, Ms. Parker, and Mr. Riddler were presented with gifts as a token of gratitude for their hard work as club advisors. Ms. Galante, who has been an advisor for Model UN from the very beginning, expressed her disbelief that the seniors had grown up so quickly. Sophomore Constanza Montemayor was elected to be the club’s spring coordinator for the 2018-19 school year. She looks forward to continuing the legacy that the seniors have left.